Hello all. I got once again a free weekend so i decided to paint. 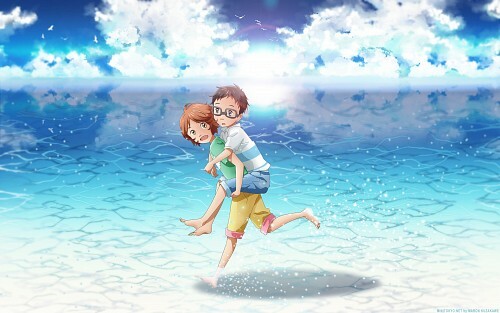 Main characters are from Shigatsu wa Kimi no Uso. I have take i snap from the opening theme, also the name of the wallpaper is from the opening theme. Its from the snapfoto where Tsubaki is. I didnt upload the snapshot anywhere but you can see it always online on youtube or somewhere else where the opening is. So i hope you like it and have a nice day you all bye, bye. Very nice job. Love the vast clear definition of it. good job , nice color, attractive wall ! Loved the colors like said, there's a problem in lighting but I'm sure you can overcome it, your latest walls are more progressive! Konecne bez te cervene a musim rict, ze se mi to tak libi mnohem vic. :D Ta modra a azurova je velmi svezi, a celkove tenhle obrazek na me pusobi velmi radostne a zive. Oblaky malujes moc zajimave, a myslim, ze i ten styl se mi libi. Vodu jsi udelala hezky, jen bych mozna vyuzila nejaky komplexnejsi vzor / strukturu vodni hladiny z netu misto copy-pastovani stejneho kouska porad dokola. Kazdopadne jsi to hezky zakryla, takze to az tak nebije do oci. Tady ode me i +fav!